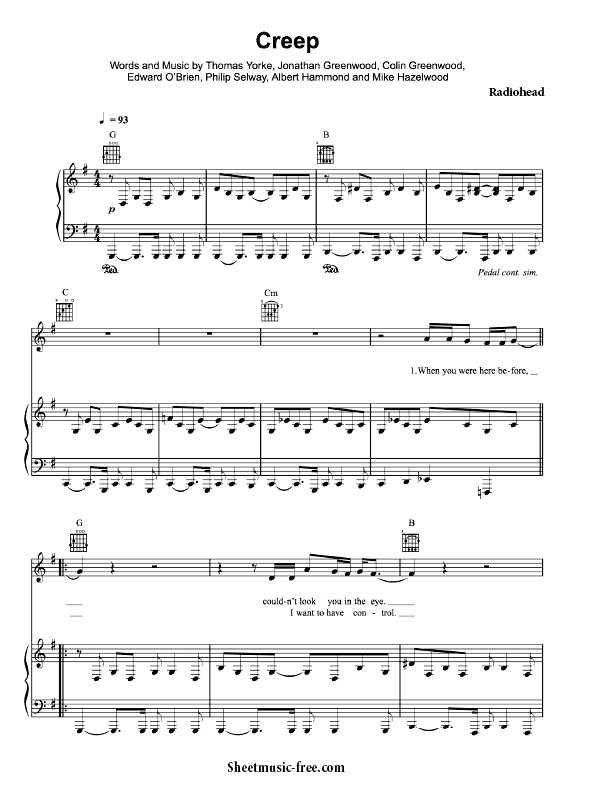 “Creep Sheet Music” by Radiohead, “ Creep Sheet Music” for Piano / Vocal/ Guitar Chords , Original key: G Major, number of pages sheet music PDF: 5, Video and Lyrics song Creep Sheet Music. “Creep’” is a song by the English alternative rock band Radiohead. Radiohead released “Creep” as their debut single in 1992, and it later appeared on their first album, Pablo Honey (1993). During its initial release, “Creep” was not a chart success. However, upon re-release in 1993, it became a worldwide hit. Attendees of Radiohead’s early gigs often exhibited little interest in the band’s other songs, causing the band to react against “Creep” and play it less often during the mid-to-late 1990s. It is included in the Radiohead: The Best Of compilation album.